During our first Christmas together, The Patient Wife and I had very little money. I had lost my management job the day we got back from our honeymoon and I was working as much as I could in a part-time job for the Boy Scouts. It KILLED me that I couldn’t make enough money to buy all the presents that I felt my new bride deserved. 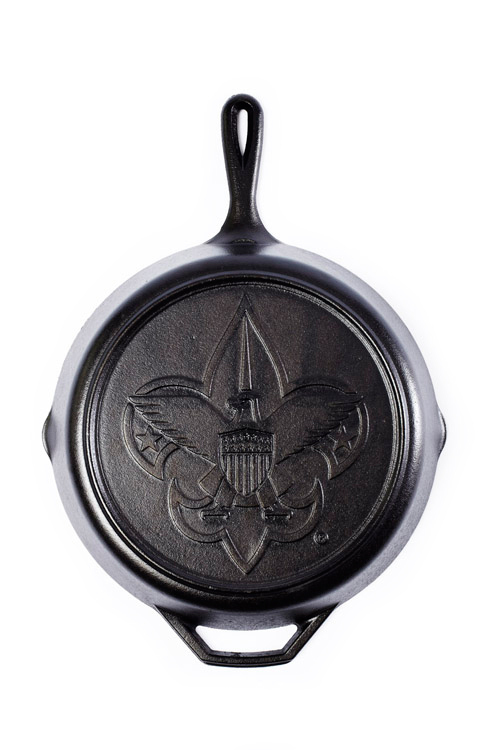 Since my wife is the head chef of our house AND she has wholeheartedly supported my scouting lifestyle, I bought my wife the nicest thing I could afford: The official, licensed, Boy Scouts of America 10″ cast-iron frying pan. Fast forward to our first Valentine’s day. The Patient Wife spent weeks planning our perfect first Valentines meal: beef tenderloin and bacon-wrapped shrimp. The shrimp and the bacon we roasted in the oven and turned out BEAUTIFULLY. The steak caught on fire, stuck to the pan, and burned. We were now officially terrified of cast iron. I finally bit the bullet and took a class on dutch oven cooking. That lit a fire and now I try to cook something in cast iron every day. My food tastes better, smells better, and looks better. It’s a great way to get more iron if you’re anemic. You don’t need to make anything fancy. Cook some eggs. Make a grilled cheese. Sautee some onions! Make a stir fry! Boil some water! It’s SO EASY. Cook one thing in it and you’ll be hooked. You’ll use it for everything and anything. You’ll love it so much and your kids will fight over who gets it in your will. To get you all fired up about cooking in cast iron, I am sending one lucky reader an 8″ Lodge frying pan. For free. Yep. For free. You will use this pan and you’ll LOVE it. All you have to do is leave me a comment (only comments with full name and e-mail address will be counted!) by 11:59 PM CST on Thursday, November 16th 2012. In your comment, tell me what your cooking experience is or isn’t with cast iron! Do you love it? Do you hate it? Have you never used it? What will you cook with it if you win? I want to know! I’ll use random.org to pick a commenter to win, and you can’t win unless you leave a comment! Fine print: Drawing is open ONLY to Continental U.S.A. residents aged 18 and older. This blog and its author is in no way affiliated with or endorsed by Lodge Manufacturing. I paid for the skillet myself and am not being compensated or reimbursed to provide this product.